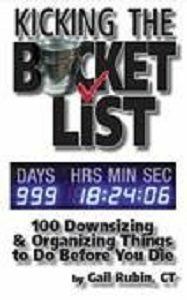 In Kicking the Bucket List, Gail Rubin offers a helpful list of 100 things to do before you die. As I mentioned in a prior blog, this is a good, light read and planning tool to help you, your clients, and their loved ones. Rubin has been a speaker at a past event of the American Academy and is a regular contributor to the Academy blog. In this blog, I’ll look at a few more of her helpful hints. In tip 49, Rubin suggests emptying out storage units. Storage units are a deceptively easy way to increase the amount of clutter in your life, but out of sight. Storage units often are forgotten for long periods of time. Of course, each month, it costs hundreds of dollars just to store those items. If the owner is ill or dies, the storage bill may be overlooked and the items may be lost. Emptying storage units saves money and makes it less likely that precious heirlooms will be lost forever. In tip 46, Rubin suggests going through old photographs and discarding duplicates, out of focus photos, unexceptional landscape photos, etc. This might be a good opportunity to take a trip down memory lane with an older member of the family who knows the people in the photograph. Sometimes, it can be helpful to write a description on the reverse of the photograph. In tip 43, Rubin talks about the items you’ve decided to retain. Perhaps there’s a story behind the item and why a seemingly ordinary piece holds special significance in your heart. Preserve and convey that story to others so that you can preserve that as part of your legacy. In an upcoming blog, I’ll look at some more helpful hints from Rubin.